common misconceptions you may have heard about PTSD. MISCONCEPTION: Only the mentally weak develop PTSD. This misconception is especially prevalent among men, who are socialized from a young age that emotions are “feminine” and “weak,” and they should therefore repress them. However, developing PTSD has nothing to do with weakness; it is triggered by an extremely traumatic event that changes brain chemistry and has a profound effect on the daily lives of those who experience it. It can affect anyone who experiences trauma, and has nothing to do with being mentally weak. 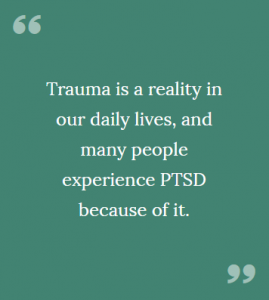 MISCONCEPTION: Those who experience PTSD are violent and unstable. The symptoms of PTSD that manifest vary from person to person. Even if PTSD is triggered by violence, a sufferer won’t necessarily experience violent outbursts. How a person reacts to trauma is dependent on their own unique personality traits. For example, many PTSD sufferers will become avoidant and detached from their loved ones, or experience difficulty with memory. Symptoms may also fluctuate in severity over time. MISCONCEPTION: People with PTSD immediately experience symptoms after the traumatic event. Symptoms of PTSD often do not begin to manifest until a month or so after the traumatic events. Sometimes, a sufferer does not process the event until later, and re-experiences it through flashbacks. To be diagnosed with PTSD, one must show a minimum of one recurring symptom, three avoidance symptoms, and two hyperarousal symptoms within one month. As you can see, PTSD is a misunderstood mental health disorder. However, it is important to understand that it is a treatable condition. Therapy has proven to be an effective treatment method for many people who experience PTSD. If you are in North Texas and need help with your PTSD, Tidemark Therapy can help you. Contact us today for information about making an appointment with our PTSD therapist in North Texas.